Decorating with Colour ~ Video Home Tour! Whether carrying out a small re-design or a huge renovation project, knowing how and where to start is the hardest step in decorating. Having recently been stumped with my own redecoration project, I was mystified as to why I couldn’t make the leap to start buying new pillows and rugs for my sorely granny-chic vacation home. Then it hit me, an epiphany, It all starts with the colour palette. I had ignored my time tested decor sensibilities and forgot to start at square one. 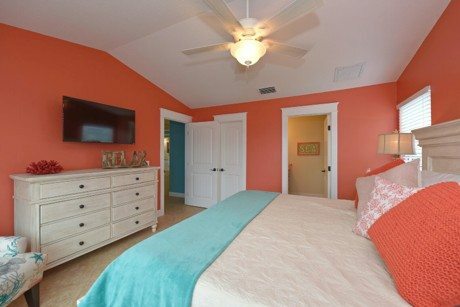 I was totally inspired while visiting friends on a sleepy little Florida Island called Anna Maria, I was struck by the clever use of colour throughout their home. The colour palette was a perfect lesson in bringing in all the juicy colours of their tropical setting without over doing it. Scott and Joda Coolidge first bought a little 2 bedroom uninspired cement block house, 2 doors down from the beach and quickly went about gutting it and transforming it into the bright and cheery beach house it is today. Full of bright yellow and turquoise colours to create the tropical mood that they were craving away from their northern lives. 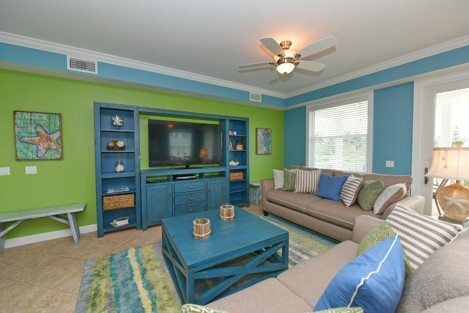 Their little cottage was completely transformed and aptly named it “Surf’s Up” from the inspiration they took from the ocean. After finding their vacation home too small to fit their extended family, they bought a larger home on the waterfront to take full advantage of island living. Joda wanted to create her own “parenthood home, where there were plenty of open living spaces both inside and out. Enough space on each of the three floors to have lovely spots for fun or quiet”, depending on what her family desires. Her four grown children love to congregate for family game time, whether that’s around the outdoor TV or with a board game in the multi-functioning living room. Their colour palette started with deep blue sky, lemon-lime, coral, and a sunny yellow. Inspiration was taken from the beautiful blue skies and sunsets found on the island. Joda was inspired by the Key West ambiance of the little beach town which they live in, but didn’t want to feel too overwhelmed by the colours. Buying furniture in basic colours like soft beiges and pristine white helps make decorating with bold and bright colours a snap. The bedding and pillows are changed according to the homeowner’s mood. The colour doesn’t stop inside either. Taking cues from their outdoor setting, the cabana which was cleverly carved out of the ground floor of the elevated home, is bursting with tropical colour for Joda’s family to enjoy while they are chilling out al fresco in their outdoor living room and bar. Joda finds that the colours create a backdrop of sheer joy, that her family feels when they are visiting the island.